OMAHA, Neb. 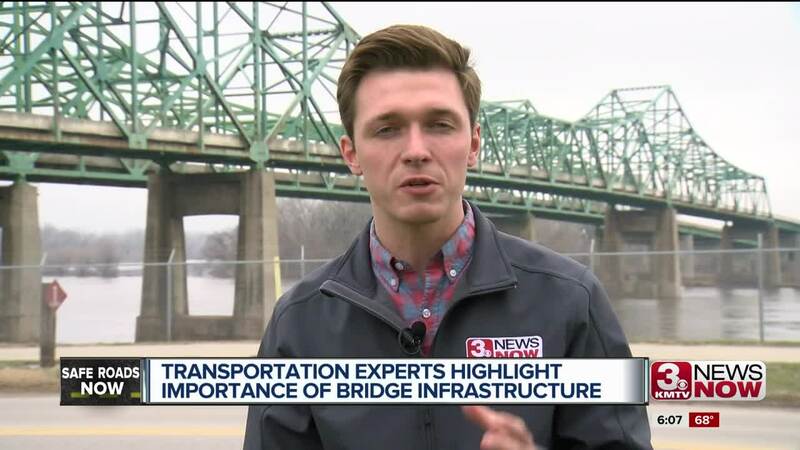 (KMTV) — Nebraska transportation leaders say more can be done with technology to improve travel and bridges have taken a toll over the past few weeks. Groups like the Nebraska Department of Transportation met at the University of Nebraska-Omaha to discuss the impact of transportation. Mangled, marked off, and destroyed. Flooding impacted some Nebraska bridges. Dr. Deepak Khazanchi is an information science and technology professor at UNO. He says most bridges were not built to withstand severe flooding, so repairs will be required. "A lot of our bridges in the country and Nebraska are 100 to 150 years old," Dr. Khazanchi said. "There is an enormous amount of investment needed to upgrade this." The American Society of Civil Engineers rated bridge infrastructure in the U.S. as satisfactory. Experts at UNO's technology panel say there are opportunities to improve that. Dr. Khazanchi is researching what kinds of sensors can be put on rural bridges to monitor the health of their infrastructure. He thinks investing in sensors could help prevent potential collapses that result in economic loss for the state and drivers. "The use of sensor technologies as a part of the design of new bridges would allow us to monitor flood levels and also weather patterns," Dr. Khazanchi said. "What we are trying to investigate is what kinds of sensors can we put on bridges that are already built so that we can collect the kind of data that we need to monitor cracks, vibration and what kind of loads are going on bridges." Another panelist is Steve Ingracia with the Nebraska Department of Transportation. He highlighted a new NDOT resource released Thursday that monitors the repair status on state bridges. "As I toured some of the flood-damaged areas and you see damaged roads and bridges and things we're dealing with as the dot right now," Ingracia said. "All the layers of those roads are exposed and you can see the concrete, the base layer, foundations in the bridges where things have been washed away." The map on NDOT's website shows state-wide highway damage. Clicking different segments shows a report on the closure status, the contractor responsible for reconstruction and a projected opening date. "When we use the term technology, we tend to think of cellphones and communications and computers, things like that," Ingracia said. "Technology really represents a lot of different things."